How can you be safe around railroads? First, of course, "DON'T TRESPASS!" Stay well clear of moving trains. You may be severely injured by dragging equipment. Do not stand on or walk between the rails of any track. Never step on a rail while crossing tracks. No matter how shiny, the railhead has a thin film of grease that will land you fast. Do not cross over a standing cut of cars or equipment. Better yet, don't climb on equipment. No-brainer. Believe it or not, trains can be extremely quiet, especially on welded rail and when you least expect them. I can vouch for this firsthand. New cars like the big TBOX 60' boxes and TTZX centerbeams...when you're kicking them in the yard one at a time, you DO NOT hear them coming! By the time you hear one, it's already going by! Do not walk into tunnels or across bridges and trestles. I've seen this done, too. Come on guys. 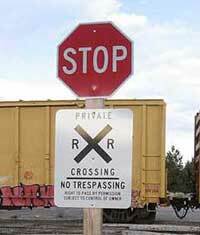 ALL railroad property is PRIVATE property. Free access is not permitted because of the dangers thereon. If you've just been skimming up to this point, please pay close attention to what I say now. I've seen banding fall off a car and get dragged along, or chains off log cars like the JTTX flats. If that stuff can wrap around a facing point switch stand, rip it out of the ground, gap the points and derail the train, imagine what it could do to a human. Good way to lose your head if you stand too close.